The Meadowlands Commission’s Fifth Annual Butterfly Day at DeKorte Park in Lyndhurst in late July was a big hit. More than 700 people — mostly families — enjoyed watching and learning about nearly 20 species of these graceful creatures. Last week, toward the end of a bird walk at DeKorte Park, a nature group stopped by Jill’s Garden to see what was fluttering about. The short answer was: quite a lot in a short amount of time. In a matter of minutes, we saw a red admiral, eastern tiger swallowtail, black swallowtail, silver-spotted skipper, broad-winged skipper, Peck’s skipper and monarchs, as well as an over-caffeinated clear-wing moth. 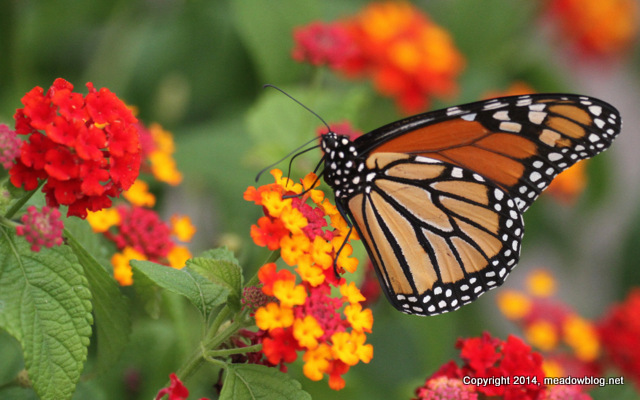 Overall, this year has been an unpredictable one for butterflies. The number of species seems to be up, but the numbers of butterflies themselves appear a bit lower. Some butterfly aficionados believe the season is later this year because of our long and cold winter, so perhaps the numbers will pick up. But you don’t have to visit DeKorte to see wonderful butterflies and clear-wing moths nearby. The Meadowlands Commission is pleased to announce the Pelican Challenge. An American White Pelican has been seen on DeKorte Park’s Saw Mill Creek mudflats for 39 days in a row. The person who correctly predicts the last day the pelican will be seen will win an NJMC pontoon boat ride for two. The contest is free, and the NJMC’s pontoon boat rides are especially outstanding in late August and September. If the pelican is still around after pontoon boat season ends, the winning trip can be taken in spring 2015. More on NJMC pontoon boat rides here. The pelican has been here so long that it now has a name: George, after the famous American crime novelist George Pelecanos. More on George Pelecanos here. 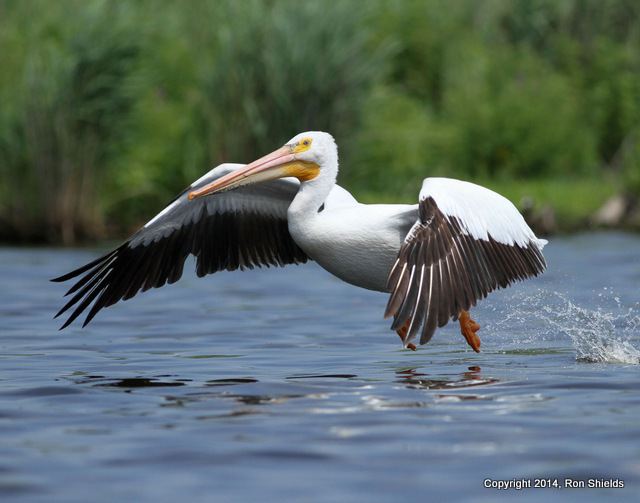 More on American White Pelicans here. We have decided that it will save time if everyone asks “Did you see George today?” instead of “Did you see the American White Pelican today?” But we digress…. Please enter and join the fun. You must enter by 5 p.m., Friday, Aug. 15 to be eligible. One entry person, but all family members may enter individually. And yes, George has been seen today.